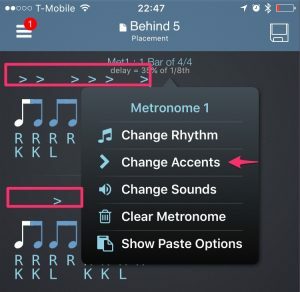 To add accents to your rhythm you need to go to the Change Accents page. 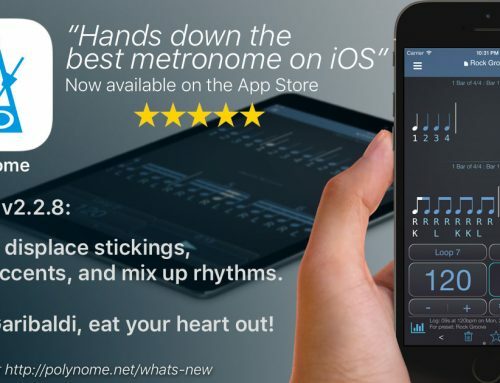 On this page you assign accents to your rhythm. You can also set the swing and accent amount, though this is more easily done from the faders in the mixer on the metronome page. a) Here you’ll see the accent pattern you enter. Tap and hold for an extra menu with accent options. b) Here you see the rhythm that you’re entering accents for. Swipe left/right to change the highlighted note which indicates where the accent/non-accent will be placed. 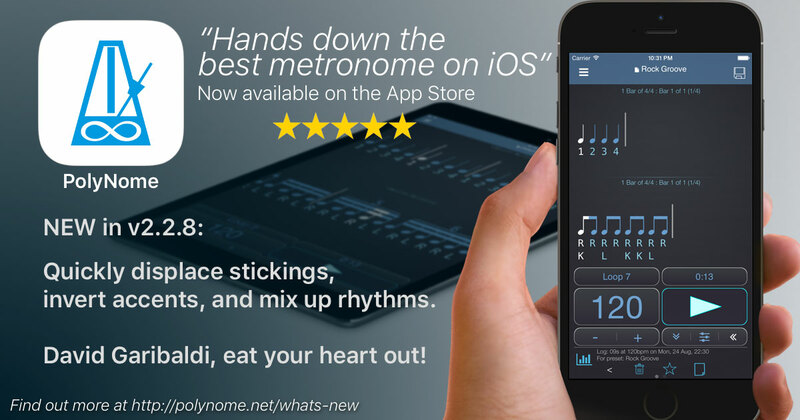 Tap the notes to jump to the Change Rhythm page. c) Here you can see the sticking that you’ve entered for the rhythm. Tap this area to jump to the Change Sounds page. d) Here you can change the Reset options to determine how PolyNome will assign your entered accent pattern. e) Use the Clear All button to clear all Accents. The DEL button will delete the item above the highlighted note. The backspace button will delete the item to the left of the highlighted note. f) Use this button to add a non-accent to the highlighted note. g) Use this button to add an accent to the highlighted note. 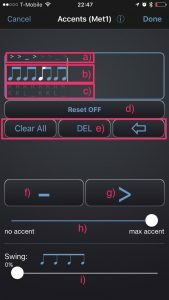 h) Use the slider to determine the difference between the volume of accented and non-accented notes. When the slider is all the way to the left accents and non-accents will be the same volume. When the slider is all the way to the right non-accents will be muted so you’ll only hear the accented notes. Accent amount can also be set using the ‘>’ fader in the mixer on the metronome page. i) Use this slider to change the degree of swing for the entered rhythm. Swing amount can also be set using the Swing fader on the mixer on the metronome page. 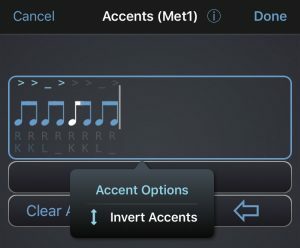 Press and hold the notation or accents in the panel at the top to bring up the Accent Options menu where you can quickly invert the accent pattern you’ve entered. The reset options define what PolyNome will do if you don’t fill the rhythm with accents/non-accents. Reset Off : The entered accent pattern will loop from where it ends. This means it can go over the bar line and may change for each repeat of the pattern. Reset Each Cycle: The entered accents will loop under the rhythm (if you didn’t fill to the end), but will always start over when the rhythm cycle repeats. Reset Each Note Group: The entered accent pattern will start from the beginning with each new Note Group. A note group corresponds to a button press on the Change Rhythm page. For example, it could be a group of 4x16th notes, or it could be a single 1/4 note. This option is useful if you want to always accent the start of a subdivision group. You can enter > _ _ _ _ _ _ _ _ _ _ _ __ _ _ _ _ and you’ll always get an accent at the start of the note group. Fill Cycle with Non-Accents: This option will just fill the rhythm with non accents where your entered accent pattern finishes.